Try these super simple chocolate cookies stuffed with ooey gooey caramel… They’re a delish indulgence and also make a great gift! Simple as they may look, these scrumptious cookies really pack a punch! Soft, chewy chocolate gives way to oozy, gooey melted caramel that just begs for a tall glass of milk… AND another cookie, since it’s impossible to stop at one. At least for me and everyone I shared these with! Keep these cookies easy by stuffing them with Rolos, a chocolate-caramel candy you can find at most grocery checkouts. Just mix up the chocolate batter, roll it into balls, stuff a Rolo inside, and roll them in a bit of sugar. For a delicious sweet-salty twist, top them with a tiny bit of sea salt and bake ‘em up! These cookies make an indulgent gift for family and friends, or just to reward yourself for surviving the holidays! Preheat oven to 375 degrees F. Line a large baking sheet with parchment paper. In a large bowl combine sugar, brown sugar, butter, eggs and vanilla. Mix together until well blended. Add flour, cocoa powder and baking soda; mix well. Cover bowl with plastic wrap and refrigerate dough for 30 minutes. Bake for 8-10 minutes. Let cool for 2 minutes then transfer cookies to a cooling rack. A rolo stuffed in a cookie – what a great idea. 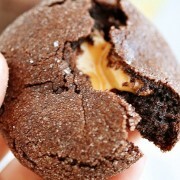 Melty chocolate and caramel inside a chocolate cookie sounds divine! These really look like the best cookies ever! These sound amazing and look mouth-watering delicious. I think I will get some Rolos today and make these. I remember the first time I had Rolos. They just came out and I was probably around 6 vacationing with my family in Chicago. I tried them and then said to my dad, ooh try these – well he ate the entire roll. Funny how some things you never forget. These will be a special tribute to my dad. I can’t wait to make them, sea salt and all YUM! yum! these look amazing! and crazy– but i’ve never had rolos! How easy! Thanks for sharing! Oooh, caramel stuffed cookies! LOVE it! These look delicious! The chocolate cookie itself looks amazing, what a treat to find the rolo melted inside. Oh wow those look worth every single calorie. Delish! These look pure sinful! And I bet they make the perfect holiday gifs too! I have Rolos in the pantry right now….uh oh! These look so, so delish! It’s been years since I’ve had a Rolo! I want to eat the whole thing! These look amazing!! Definitely going to make these….soon! I cannot wait to make these, they look fantastic! Just the chocolate cookie alone looks fantastic and then you stuff it with a Rolo!!! I could look at these pictures for days. What a great combination. I’m drooling over here. These look fantastic. Pinned! My favourite combo of flavours! THis looks amazing Georgia.. so simple, but looks so complex. I love it. Bookmarking. As long as the caramels are soft, not hard, they should work fine! I made these soon after you posted them – OMG, amazing!! I made these tonight. They are amazing! Mine didn’t come out as flat as yours, they stayed a little rounded but tasted wonderful! Thanks so much for posting the recipe! These look so amazing! I need to make these ASAP! My 12 year old son made these and they were wonderful. I highly recommend that you use Dark Chocolate cocoa. We bought it because it was on sale and cheaper than regular cocoa; I went back and bought another package because the cookie part turned out so well. Have recommended this many times. Thank you so much-you did a great job! Why would the salt be “optional” in a salted caramel chocolate cookie recipe? Be bold. Under the thumbnail image in the recipe, there’s a small, round “Print” button. This is the same on every recipe. Hope that helps! Made these this afternoon, and know they will be a family favorite, a staple, one that I will go back to again and again. They are terrifically easy, rich and delicious. Clean up a breeze–not too much involved. I used a grind of pink Himalayan sea salt on each. Thinking I will try a coarse salt next time and decide which we prefer. Thanks for sharing this great recipe!! I’m excited to make these! But the ingredient list says 1/4 c of granulated sugar, and then at the bottom of the list it calls for 1/2 c of granulated sugar. is that a mistake? Or are one of those portions meant to roll the dough in? The 1/2 cup of granulated sugar goes into the cookie dough. The 1/4 cup is for rolling the cookies in. Just wanted to say that I made these last night for a bake sale at work and I have been inundated with praise for them! I made two batches and sprinkled them with salt at the end of cooking. They weren’t quite as uniform as yours though, but tasted amazing! Thanks for such a lovely recipe. I’ll be making these again! I tried this recipe with peanut butter cups from Trader Joe’s (I cut them in half, they’re rather big). Turned out just the same, but better for the chocolate-peanut butter combo lover. This recipe is a hit either way. Hey I am so grateful I found your site, I really found you by error, while I was researching on Askjeeve for something else, Regardless I am here now and would just like to say kudos for a tremendous post and a all round thrilling blog (I also love the theme/design), I don’t have time to read through it all at the minute but I have bookmarked it and also added your RSS feeds, so when I have time I will be back to read much more, Please do keep up the excellent work.